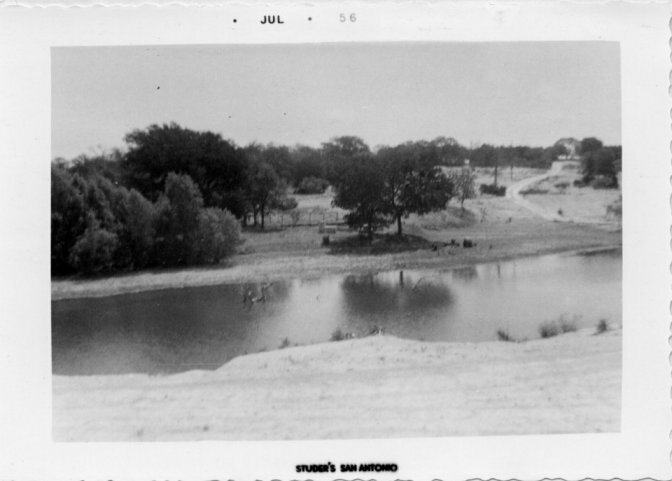 This is a 1942 newspaper photo of the rock garden, which was started in 1936, and which marks the genesis of the Coxville Zoo. The first animal, a monkey named Junior (see below), came in 1939. This is Junior, the small, friendly monkey that delighted many visitors to the Coxville Zoo. 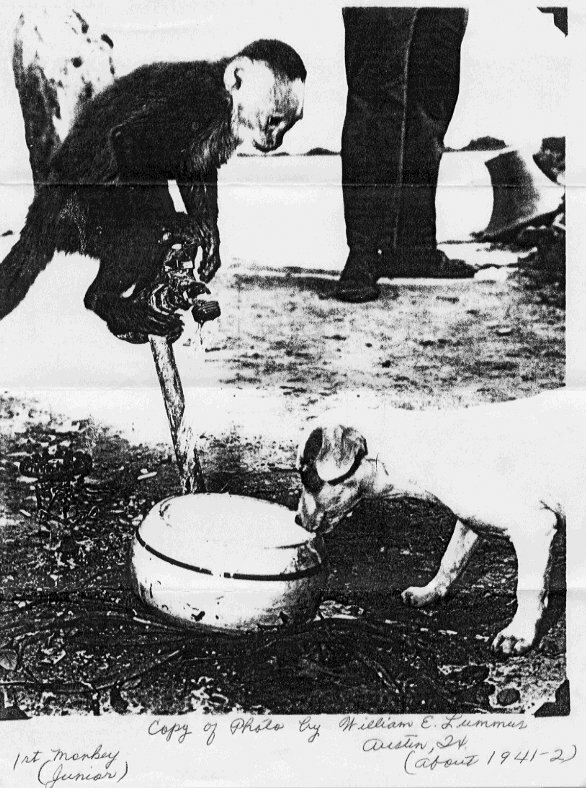 This is the monkey referred to in a 1942 Austin American newspaper article. Photo circa 1941-1942. This is a map of the Coxville Zoo drawn by an Austin school girl in aproximately 1952. The top of the map faces west. 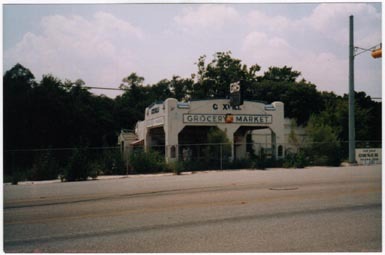 The Dallas Highway is today's North Lamar Boulevard. The lake in the upper right part of the map is the lake in the photograph below. This is a lake that was created by damming Wells Branch creek (which runs north to south through Walnut Creek Park today). A couple of swimmers can just be seen in this photo. July 1956. Another feature of Coxville is a one-mile private lake. Fed by springs, the lake is between 16 and 18 feet deep. ... Swimmers find a cool reception in the refreshing waters of the lake. "Fishing is your best bet at the lake though. They'll be biting fine in July." Cox declares. For 50 cents a half-day or $1 a day, fishermen can try their luck at hooking the brim, bass, and catfish with which the lake is stocked. The dam was torn down after the city purchased the property for the park. Click here to see a large version of this photo. 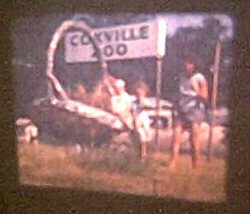 This appears to be two small children with their mother near a large basket at the entrance to the Coxville Zoo. Photo circa early 1960s. Photo taken from an 8mm film. 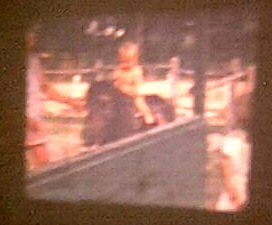 This appears to be a small boy riding a donkey at the Coxville Zoo. 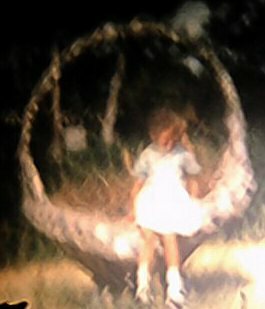 This appears to be a girl sitting on a large basket at the entrance to the Coxville Zoo. This is Alvin Cox, the owner of the Coxville Zoo. From Go, February, 1964.